The New Forest and its National Park in Hampshire is a truly wonderful place with its thatched cottages and wild roaming forest ponies and cattle. There are many hidden gems and secrets making it a haven for walkers, cyclists, horse riders and tourists. The best way to enjoy the forest is to leave the car and get out there and explore. There are so many circular routes and activities suitable for all ages whether you are able or disabled, which can be obtained from any of the tourist information centres, with picnic areas and toilet facilities. The New Forest Museum and Visitors Centre is the largest and best place for any information and advice. For more about the New Forest please visit our walk “Fordingbridge-Woodgreen-Hale-Godshill round”. Keyhaven is a hamlet on the south coast of England in the county of Hampshire and lies in the district of the New Forest and just within the borders of the New Forest National Park. Keyhaven means “Harbour where cows are shipped” years ago cattle and sheep were shipped from the Isle of Wight to the water meadows of the Avon around Christchurch. It also had a fishing trade which has been in decline for a number of years and tourism has now taken over, especially in sailing. 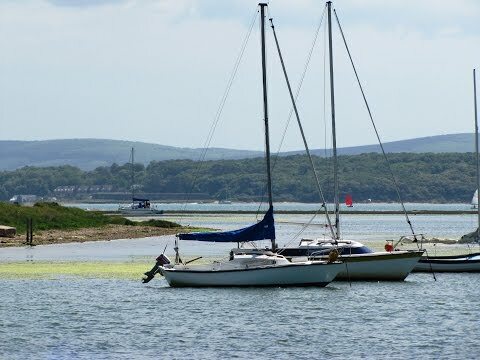 The Lymington – Keyhaven Nature Reserve, covering 500 acres from the mouth of the River Lymington and the village of Keyhaven, was purchased by Hampshire County Council to protect its historical and wildlife heritage. The adjacent mudflats and salt marshes forming the Keyhaven and Pennington Marshes Reserve are leased by Hampshire and Isle of Wight Wildlife Trust. These two reserves are situated within the New Forest National Park and together they protect an extensive area of coastal habitat. There are paths around the reserves are for everyone to enjoy the wildlife and the area of outstanding natural beauty. The paths are fairly level for cyclists as well as walkers and some are suitable for wheelchair users. Just inside the sea wall there is a series of shallow, brackish lagoons connected to the sea through a system of sluices and tidal flaps. These lagoons are a haven for wildfowl and migrant wading birds and along with the ponds and ditches the reserve supports many wetland plants, animals and birds. Hurst Castle, built between 1538 and 1540, is one of many coastal fortresses built by Henry VIII and in the 1870’s enormous armoured wings were added by Lord Palmerstone. Situated at the end of the shingle spit it was the perfect place to defend the western approach to the Solent and England. The castle is now owned by English Heritage and can be reached by foot or by ferry and is also only 0.75 miles from the Isle of Wight which is the closest point between England and the Island. The views from the top of the castle are wonderful. The ferry to Hurst Castle sails daily from Keyhaven between 10am and 5.30pm every 20 minutes. The castle is also open daily from April to September 10.30am to 5.30pm, October daily 10.30am to 4pm and November to March weekends only 10.30am to 4pm. We park at the side of the road near the spit just at the far side of Keyhaven where it is free parking. We walk forward towards the village going through a gate on the right and follow the bank to the Hurst Castle Ferries departure point then we turn left to the boat club. We follow the path to the right which goes round the back of the club and into the car park. At the car park we turn right along the tarmac cycle path, going back on ourselves. Just after the bridge and the car parking area we turn right and go through the gate. We now just keep following the Solent Way along the bank, with the marshes on our left and the Solent on our right, until we arrive at Oxey Lake. We keep following the path round. We pass a bridge on the right walk forward a short way then go through the gate on the right with the water on our right until we arrive at some buildings here we turn left on a path with some trees on both sides. At the road we turn left (but if you turn right there is a pub only a few minutes away) and follow the road round until we come to a t-junction. We turn left and follow the road round to the right until we arrive at the end of the road, where there is a parking area, a footpath on the left and a cycle path to the right. We take the cycle path which takes us back into Keyhaven. We make our way to Hurst Castle Ferries to catch the ferry. We then enjoy our wander around inside Hurst Castle and the views from the top are wonderful. We then walk round the outside of the castle but there is a high wooden barrier, with rungs to step on, which you have to climb over. We then follow the Hurst Spit or causeway between the sea on our left and the lagoon on our right until we arrive at a bridge. We cross the bridge and walk on the road back to our car. This is an easy, flat walk also suitable for wheelchair users and cyclists, except along the coast line from Hirst Castle to Keyhaven where the track is very stony. Approx 7.75 miles using OS map OL22. Keyhaven in the New Forest of Hampshire, Southern England. From Salisbury take the A338 towards Ringwood. At Fordingbridge take the B3078 towards Cadnam then take the A337 for Lyndhurst, Brockenhurst and Lymington. After Lymington take the B3058 to Milford on Sea. In Milford on Sea take a left turn onto a small road to Keyhaven. There are public toilets in the car park at Keyhaven and also at nearby Milford on Sea. For refreshments there is the Gun Inn at Keyhaven and plenty of shops, cafes and pubs in Milford on Sea. There are also toilets and a cafe at Hurst Castle.